Abigail Clarke Dating a millionaire; disclose her Affairs and Relationship..Clarke also revealed that she used.e used to pay half the mortgage..
Former Towie star, Abi Clarke, she is a fitness model who is famous for appearing on the reality show The Only Way is Essex. Abigail Clarke aka Abi made doesn't make much of gossips besides her reality show. Recently, she is making lots of news and it's not definitely about her brands or show. Abi is recently dating a millionaire in a secret way and this has caught an eye of many media. So who is this celebrity? 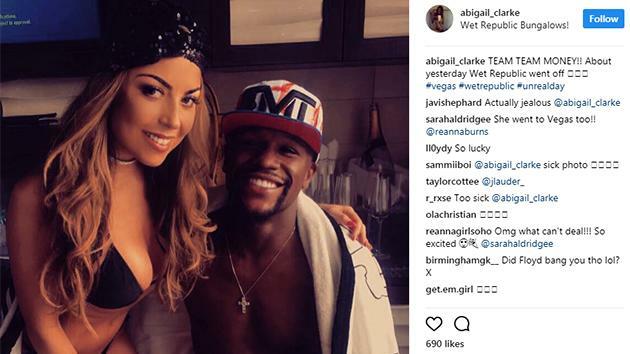 Reality star Abi is recently dating boxing star Floyd Mayweather who has reputation for hanging out in strip clubs several times. Mayweather who knocks out his opponent inside the ring finally got his heart knocked out by this beauty. When the news of Floyd's new girl rumors came out, everyone was curious about who is Floyd's Mayweather secret girlfriend? Animal party Floyd was spotted with Abi with many of events and parties and Abi herself has whisked her out to visit Mayweather several times. Some of the resources have revealed that Floyd has even introduced her to his family. You might be eager to know how model met a boxer?Well, this unlikely pair met while Essex star was on a girl's holiday in Las Vegas in 2016 since then they have been enjoying their secret romance. An insider reveals that Abi really liked her at first sight and was blown away by Floyd's sense humor. Since they have been enjoying a string of secret dates with Floyd Mayweather and their secret got into media when they were caught together in several events. The multimillionaire boxer romance blossomed with the model in last summer and now Former Towie star Abi Clarke has been enjoying a string of secret dates. In Aug 26, inside sources, have revealed that Abi could be at the ringside when Mayweather takes on McGregor at the T-Mobile center in Las Vegas. But then in 2016, they ended up in the relationship after a year. The news of their break up came when Clarke revealed about their split and how she took revenge on Rob after the breakup. After splitting from Davie, Abi took all the furniture and left a sheet stained with dog wee after Rob kicked her out of the home. After ending her relationship with Davie now she is linked with boxer Floyd. Hope this relationship last long unlike Abi's previous affairs.